Neidpath Castle, a fantastic L-plan tower house, overlooks the River Tweed, roughly a mile to the West of the town of Peebles in the Scottish Borders. 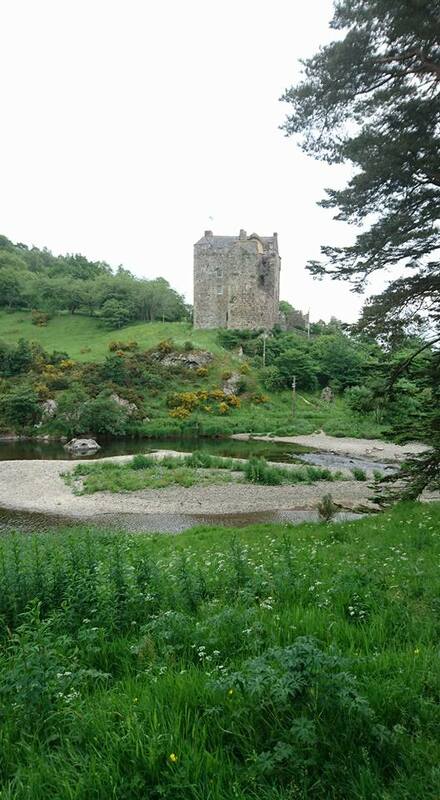 It's likely that this position on the river, was originally occupied by a small castle, probably built around 1263 -1266, by Sir Simon Fraser whilst he was the High Sheriff of Tweeddale. 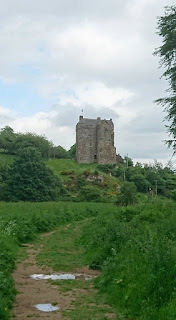 During the 14th century, the Neidpath barony was absorbed into the Hay family's fortunes....and it was Sir William de Haya that most likely built a castle or tower house on this site in the late 14th century. The lands in this area were successfully held by the Hay family right through to the 17th century. The principle seat of the Hay family at this time was Yester Castle, though the family still used Neidpath on occasion. In 1563 Neidpath played host to Mary Queen of Scots, and then, some twenty four years later, to her son, James VI. In 1645, Neidpath was garrisoned against James Graham, 1st Marquess of Montrose (Royalist) by John Hay of Yester Castle. The following year he joined the Kings cause, and received the Earldom of Tweeddale as a reward from Charles II. In 1650, as Oliver Cromwell invaded Scotland, Neidpath was attacked by the advancing New Model army. Historians disagree as to whether it was simply surrendered to Cromwell's forces, or if it suffered some sort of siege. It's quite possible that the 13th century tower, built by Sir William de Haya, was destroyed by artillery fire at this time. Above. Looking North across the River Tweed. In the 1660s, the 2nd Earl of Tweeddale, John Hay, was declared bankrupt. To satisfy his creditors and raise money to pay off his debts, he was forced to sell Neidpath to William Douglas, 1st Duke of Queensberry. 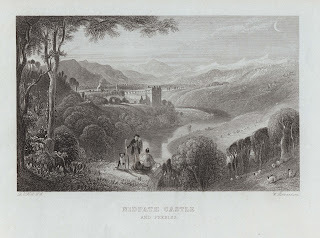 Douglas later gave the castle to his son, William Douglas (later 1st Earl of March) William Wordsworth and Sir Walter Scott are both said to have visited the castle during William Douglas' ownership. When William died, in 1810, the castle, with the Earldom of March, passed to the Earl of Wemyss. To this day, the castle still belongs to the Earl of Wemyss, and the title, Lord of Neidpath is still a courtesy title held by the current owner. Above. Looking West along the footpath leading to the castle. The L-plan tower was somewhat neglected during the mid to late 18th century, so much so that, in 1790, part of the upper floor of one of the wings collapsed.....damage that can still be seen today. 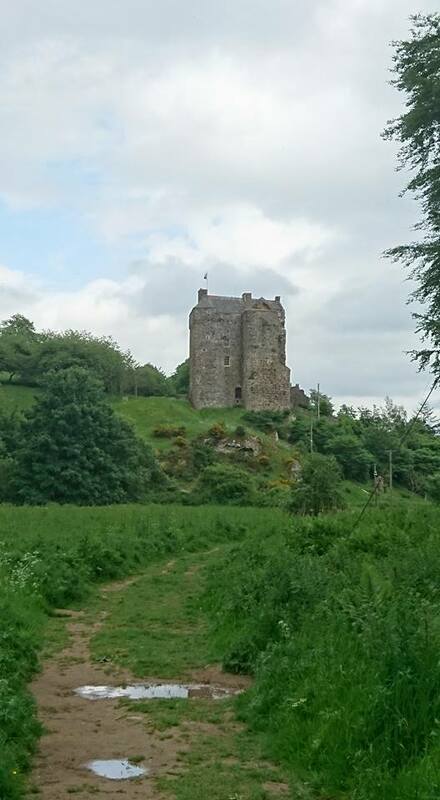 The battlements are roofed, a luxury seldom seen in Scottish tower houses. The tower house still has very few windows, a structural point that is usually changed over the years in most tower houses as they become comfortable homes rather than defensive buildings. The first floor hall and the basement are vaulted. Above. Old print of Neidpath Castle. The castle is not open to the public, though it can be viewed from across the river, and from the approaching path that runs to the East of the castle.